Topic: Apollo command module: silver or white? slk6517 I have noticed that in many models of the Apollo command module, the capsule is metallic and others appear white. This also applies to various photos I have seen. Maybe you could give me a simple explanation to this? mdmyer Before and during the launch the command module is was covered by a protective shield that was white. When the Saturn V was high enough to allow the astronauts to jettison the launch escape tower this cover was pulled off with the escape tower. Under the protective cover was the metallic silver or gold mylar that you often see in photos. The metallic mylar would reflect heat from the sun while the ship was in space. I think some or most of this mylar would burn off during reentry. spacecraft films Mike is correct. The only clarification I would make is that the mylar was silver. Bright chrome-looking. Almost mirror-reflective, cut in lengthwise pieces that were diagonally applied acoss the CM. This is most easily visible in flight photographs of the CM from the LM. The gold look only came after splashdown, when the pieces of mylar that were left on the command module took on a "goldish" tone from reentry. Unfortunatly Monogram's otherwise fairly accurate 1/32nd command module model molded the CM in gold chrome covering - perpetuating the idea that it was gold. Several other commecial finished models picked up on this and made bright gold metallic CMs. Some think the gold may also have been caused by the Moon being reflected on the mylar in some photographs which was interpreted as a gold covering. However, gold is not an accurate color for a mylar covered command module, for any mission. An accurate CM on the pad has the white boost protective cover (and LES). At launch escape system jettison it is covered with silver mylar. After reenty many of the mylar strips come off leaving the remaining mylar a gold tint. Now, to complicate matters, the block 1 CM was an overall battleship gray color. The Skylab CMs also had a white panel on one portion of the CM for thermal control. divemaster And, if you lightly take an alcohol swab to the 1/32 CM, the gold tone comes off and reveals a chrome layer beneath! Just don't rub too hard or the chrome layer comes off, too. Realspacemodels.com does make a removable BPC in 1/96 scale for the "big" Revell Saturn V.
divemaster And, while we're at it, there's also the confusion of why the real hardware on display of the CMs from Apollos 4, 6, 7 and 8 are white, while all of the rest are the rusty brown color where the mylar had burnt off. slk6517 I just wanted to thank all of you fine folks for answering such a question that originally I was hesitant on asking, since I thought it was such a basic simplistic question... but much to my surprise i received such welcomed answers from all. Again, thanks so much for your attention to my question. It is greatly appreciated!! FutureAstronaut Let me add a few more questions if I may. The entire Command Module was covered in these silver mylar sheets? always though it was solid metal. Is the mylar the same thing as kapton? What was used on the LM? This had a gold tone, and was never through reentry. Steve, I am also hesitant in adding this, but this is why we are here, to educate each other and share our vast pool of knowledge. divemaster CM was covered in (as I recall) three inch wide silver Mylar strips. The gold on the LM was Kapton foil. Kapton foil is fun to duplicate on models using gold candy wrappers. Duplicating the silver Mylar to scale is a lot harder. It's amazing what you remember when you're a hardware junkie. 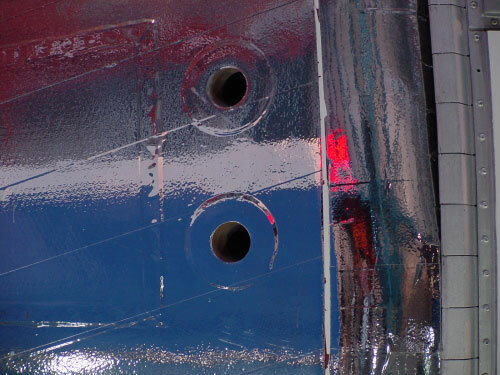 The parts of the CM exposed to space were covered in the silver mylar; I don't believe the bottom heatshield was (as it was covered by the SM during flight). Under the mylar (which is just a thin foil) was the same basic heatshield material as the bottom (what most people think of as "heatshield"). The Apollo Experience Report on the NTRS regarding the thermal protection system has bunches of info on the Apollo CM TPS. Is the mylar the same thing as kapton? Hmm, good question. I guess I usually think of them as interchangeable. The TPS document referenced above refers to it as "Kapton." What was used on the LM? This had a gold tone, and was never through reentry. The various foils were chosen for their thermal and/or micro-meteoroid protection properties. The Lunar Module Structures Handout on the ALSJ has various diagrams of the coverings used on the LM (although not much background information). And this doc refers to "mylar" instead of "Kapton." But, there's another document regarding the LM referred to on, but not available through, the NTRS which refers to both "mylar" and "Kapton." So, I guess there is some difference, and it's a matter of "the right tool for the right job." spacecraft films I think the CM is pretty well settled now, yes? Did you know the SM was actually painted with aluminum paint? If you'll look closely on the trans-Earth EVAs (from our DVDs, hopefully) you'll see the paint "bubbled" from thermal exposure during the mission. The LM? Oh, my. The descent and ascent stages were protected in very different ways, and the LM configuration evolved. For example, the "coal chutes" as I call them, just below the ascent stage RCS to protect the descent stage, did not appear until LM-5 (Apollo 11). In fact if memory serves from the processing footage they weren't added until LM-5 was already tucked away inside the SLA. The descent stage was protected by the gold mylar/kapton, in varying thicknesses, which gives it the different "hues" of gold, even tending toward orange in the thickest parts. Some missions (I know Apollo 14, but perhaps 13 as well) had bare legs. Apollo 16 had a thermal paint that shredded on the ascent stage that was eliminated from 17. If it is still around Paul Fjeld put together a nice color look at the differences in the LM vehicles, and it is also available on an excellent set of plans available from RealSpace models - highly recommended if you'll be doing any Apollo modeling. divemaster Which brings up the question, were the "coal chutes" (I like that name) covered with black mylar/kapton? Or were they painted with black thermal paint? mikej According to another report on the NTRS, it's just black paint. The plume deflectors themselves were constructed of a top layer of inconel, with alternating layers of nickel and inconel mesh. The backface is coated with "white sicon" (which I've never heard of before). dsenechal There is, actually, a distinct difference between mylar and Kapton. Mylar is a PET film, basically the same material that is used in food packaging and those obnoxious balloons that are shaped like hearts and have a Micky Mouse that says "I Love You." Kapton, on the other hand, is a transparent gold/yellow-colored Polyimide film that has better insulating qualities and much greater heat resistance. It is available in various thicknesses (this accounts for the many different color variations: the thicker the Kapton the darker the color), and can be "aluminized," as on the Lunar Module. If you'll look at the insulation on the LM descent stage, you'll actually see that much of it (including the black inconel) is held together by "clear" yellow-colored Kapton adhesive tape. This is particularly noticeable on the main landing gear struts. Were the "coal chutes" [I like that name] covered with black mylar/kapton? They were painted black on the front and silver on the back. See this example. divemaster Thank you, John. I knew that someone would have the answer. I don't know why I'm surprised that it was silver/aluminum on the back. slk6517 I never thought when asking about the initial color of the CSM, that such a response to this question would take place as much as it has. I thank each and everyone of you for all the help. sts205cdr As an aside, half of the Skylab command modules were white. Here's CM-118 from Skylab 3 showing the white half and the half where the reflective tape was peeled off. AlanLawrie So we've talked about silver strips and white paint on some CMs. What is the blue that we see on many photos of CMs, particularly those in ground test. I saw a reference that said it was a protective coating (to protect the silver strips?). But why do some of the in-orbit photos show a definite blue-looking CM (just reflection?). Also does anyone know the date when the silver strips design came into being? divemaster I was always convinced that the blue was shrink wrap, which is why it was said it looked like a giant "gumdrop."